Manufacturer of a wide range of products which include bomb calorimeter. For determination of heat combustion of organic matter and calorific value and sulfur content of coal, solid and liquid fuels. 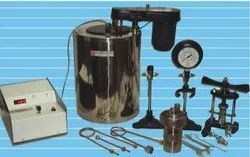 Bomb Calorimeters are supplied with Bomb Calorimeter Vessel with Bomb Support, Water Jacket, and Combined Lid for Calorimeter Vessel. Each bomb is tested as per the requirement of Institute of petroleum (IP 12/63 T). Supplied with Bomb Calorimeter Vessel with Bomb Support, Water Jacket, and Combined Lid for Calorimeter Vessel. Connecting tube with fine adjustment valve to connect pressure gauge and oxygen cylinder. With pressure gauge on stand, spanner for oxygen tube connection, ignition wire (2 meters) Nichrome. With Cotton Reel, stand for Bomb Lid, Hook for lifting Bomb, Stainless Steel Crucible. With Gelatin Capsules, Gas Release Valve, Jacket Thermometer. With Bomb Firing Unit, and Pellet Press. With Digital Beckmann Thermometer, Benzoic Acid of known calorific value 'O' Ring Small, 'O' Ring for stirrer. With Valve for Bomb and Valve Key. Looking for Bomb Calorimeter ?